Mom said I can be the star today since Little One got to do it yesterday. We’ve had all sorts of weather today. We’ve had rain, wind, blue skies, sunshine, clouds. We did manage to get outside for a bit but we had to time it very carefully! Here’s my selfie for the first of July. 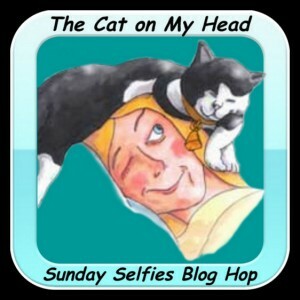 Check out all our other “furiends” at the Sunday Selfies Blog Hop hosted by our dear “furiends” at the Kitties Blue house. Hemingway, do you think Mom will let us go outside? Why would you want to go out there, Steinbeck? It’s still cold. I like being inside where it’s warm. But that white stuff is disappearing. Did you hear the wind today? That wasn’t a warm wind. I think we should stay inside. But look what Mom took pictures of tonight when she got home. Look at all those green things sticking up out of the cold ground? 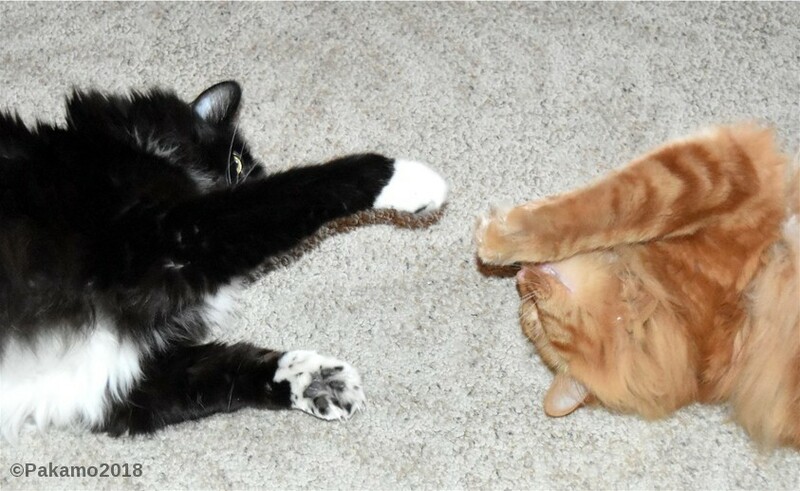 Do you think they are related to catnip? Do you think they know catnip and can tell it to start growing? And look here. See……..there’s a little bit of color showing. Doesn’t that mean it’s warm? And look at that spot of color! 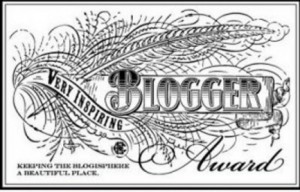 I think that’s gorgeous. I think I should have a catnip toy made out of that color. I could really celebrate spring then. Steinbeck, I think spring got lost. 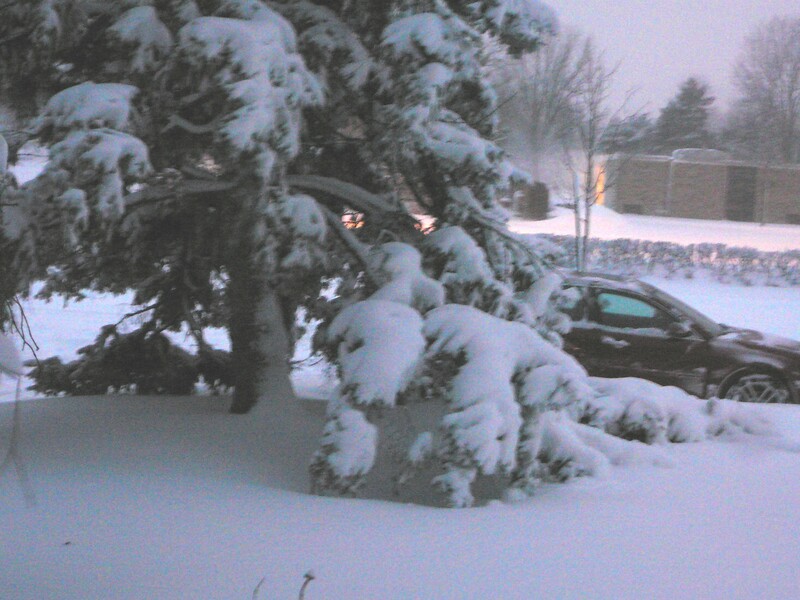 Even Mom is beginning to wonder if the spring’s GPS stopped working. She got excited about that little bit of color tonight, but she said it’s going to get cold again. So does that mean we’re going to have to stay inside the rest of our lives???? If it means not going to the doctor’s house, I’m fine with that. I decided to post my “Mr. Charismatic” look today. Mom says she loves my shiny black furs and my white furs that look like snow. We don’t have any snow here yet and that’s really strange. Mom hasn’t even been turning on her “bun warmers” in the car. I still sleep on her head at night just in case she might get cold. I hope you enjoy my selfie and I hope everyone has a fantastic week!! Don’t forget to check out what our other friends posted for their selfies. This is what I think of what happened outside today!!! Mom!!!! Have you looked outside? The flour fairies came back and they really made a big mess out there! Hemingway and I would have chased them away but you were at work and we are not supposed to go outside when you’re not here. We did try showing them our grumpy faces, though! Mom would really like to have Flower Fairies in the yard instead of those naughty Flour Fairies! Who spilled all the flour outside? Did you do that Hemingway? Don’t go blaming me for that!!! Where did all that flour go? This is my “Mr. Casual Soaking up the Sun” pose. So, Mr. Outside Cat…….did you spill all that flour yesterday? What did you do with it? I’m sure all of you readers were sitting out there wondering if we would get snow and how deep it would be. Mom says we got dumped on! Here are some pictures she took last night. They aren’t real good ‘cuz she was so late getting home. She was late giving us supper! We got it, Shakespeare, so quit whining. 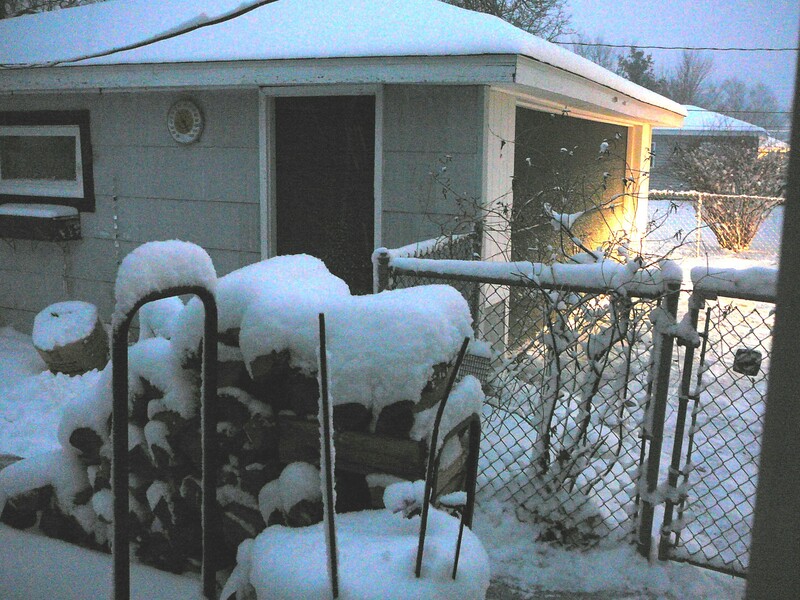 Anyway, as I was saying, it was still snowing when Mom took the pictures and the battery on her camera was low. Just take our “meows” for it that we got lots of snow! Mom said over ten inches so I think that would definitely touch our tummies if we went outside. We’re staying inside and that’s for sure! Mom’s car waiting to get into the driveway. 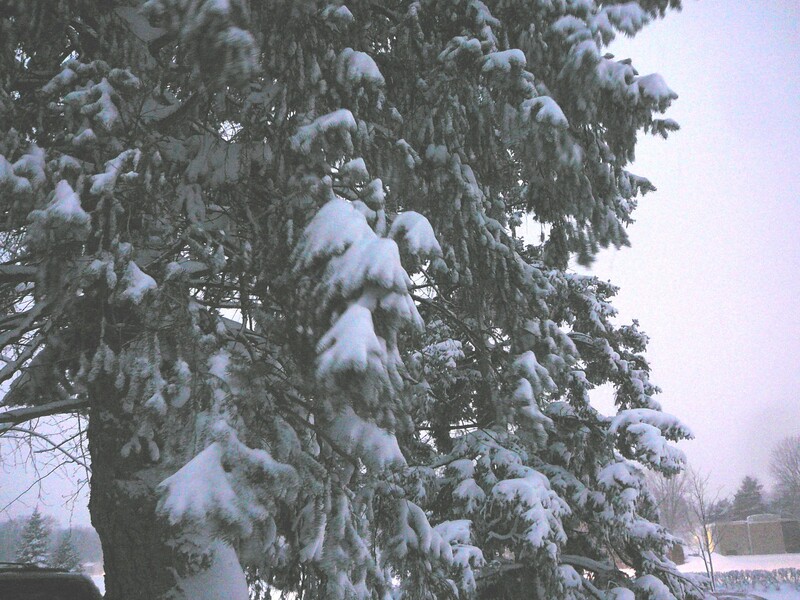 Poor evergreen has heavy snow on it….but it looks pretty! Under all that snow is wood. 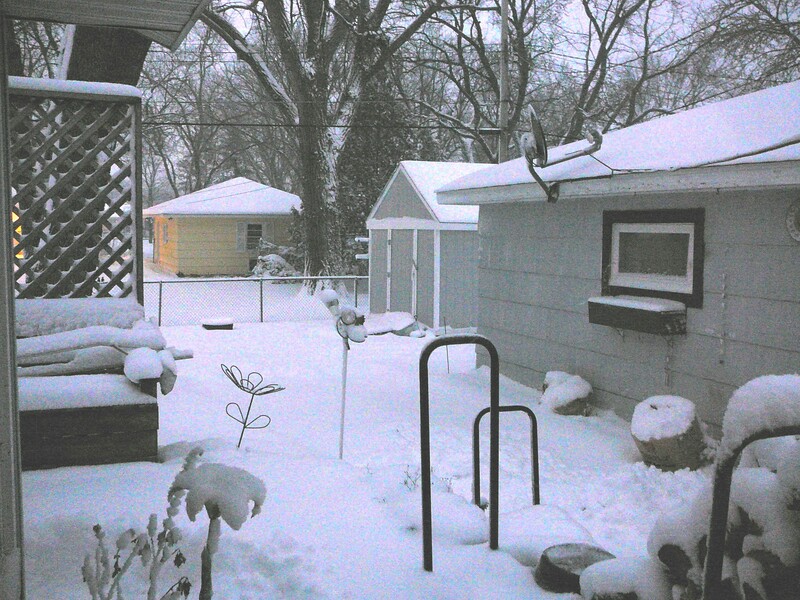 The backyard is all white now. This is not a happy face. Not only did we have zero degrees for a bit, then we went even below that so Mom said we had minus degrees. Great. Now we owe some degrees for it to get to zero again. It’s not fair! I want the green grass back so I can roll around in it. I want to listen to the birdies. I want to splash in the bird bath. I want to look for little bugs on the ground. Instead I’m stuck inside with Mom and Shakespeare and none of us are very happy in this cold!!! Could you please send some warm this way???? Thank you very much!! Mom just got back from the human food store and she said there are no degrees outside!!! I’ll be staying inside, thank you very much! So, let me tell you what’s happening. Winter finally arrived and we don’t like it and neither does Mom. She says it’s elebenty billion degrees below zero now. We think she’s stretching that a little but she did open the door after we kept telling her that we wanted to go outside. We both stuck our noses out there and they froze! No way were we going out in that cold. Maybe Mom wasn’t stretching it after all. Now I have this theory about what’s happening to the weather. Some kitties recently started looking at this old picture of Shakespeare and they decided if Shakespeare could get into that big cold box where their humans store all the food, then they could do it, too. Even though I thought he was a mouthy little kid, all the other kitties thought he was so cute and they started opening those big cold food boxes just like Shakespeare. Pretty soon they were opening the even colder part of those food boxes. Now imagine twelvty forty-sebenty of those cold food boxes standing open. That’s why it got so cold outside! First of all, I want everyone to know that Shakespeare did not open the big cold food box by himself. Mom had opened it and he decided to check it out and tell Mom what he wanted to eat. It didn’t work so now I want all the kitties to go close those cold food boxes right now. Hemingway, are you for real?? ?